We've had a lot of birthdays to celebrate this month. It's always fun to give something handmade, so I came up with this cute messenger bag that we could fill up with other fun presents. 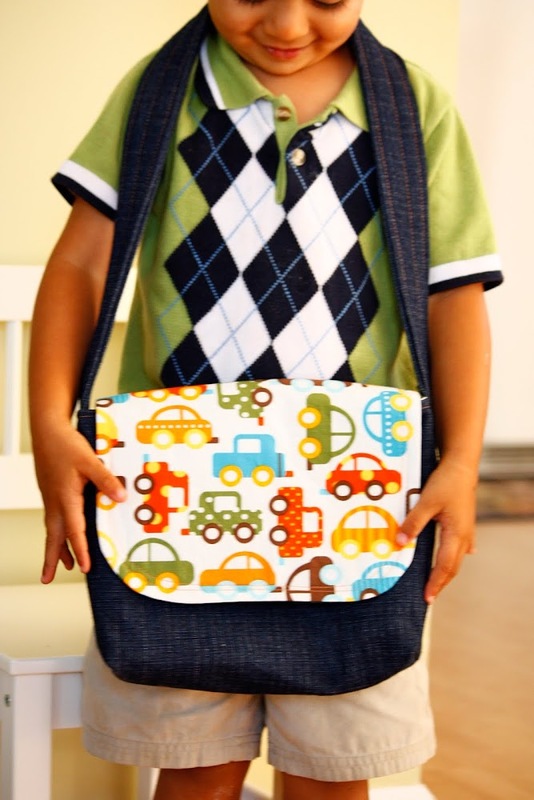 It's super easy to make and can be made for a boy or girl depending on the fabric. 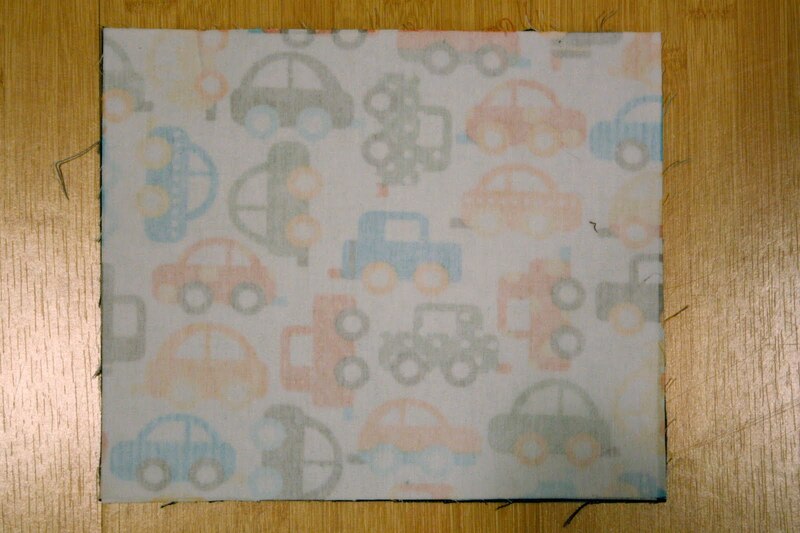 2 pieces of fabric for bag lining, 12" X 9"
2 pieces of medium weight fusible interfacing for bag bottom, 12" x 9"
1 piece of medium weight fusible interfacing for flap, 9.5" X 8"
Start out by fusing the interfacing to the outer bag pieces. In the bottom corners of the 12 inch side of both outer pieces, mark a box that is 1.5 x 1.5 inches. Then, cut those corners out. Do the same for the bag lining. 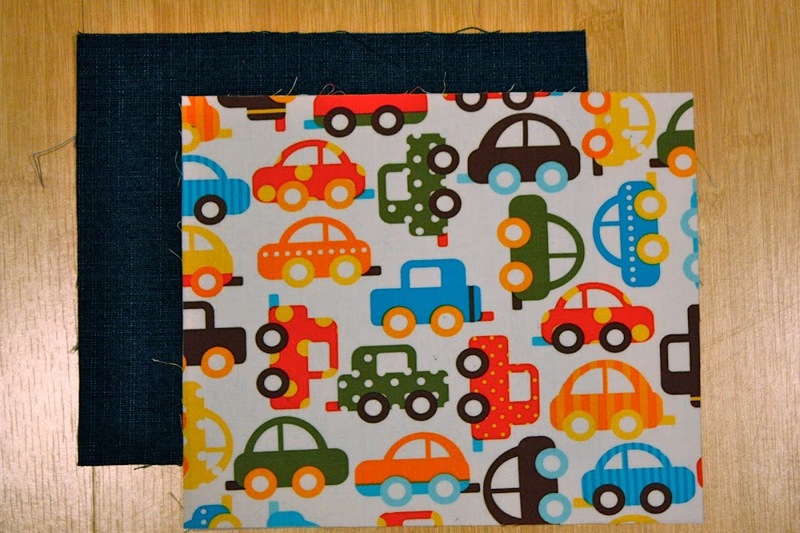 With right sides together and 1/2 inch seam allowance, sew the outer main bag panels along the sides and bottom. Do the same for the bag lining pieces. Press seams open. 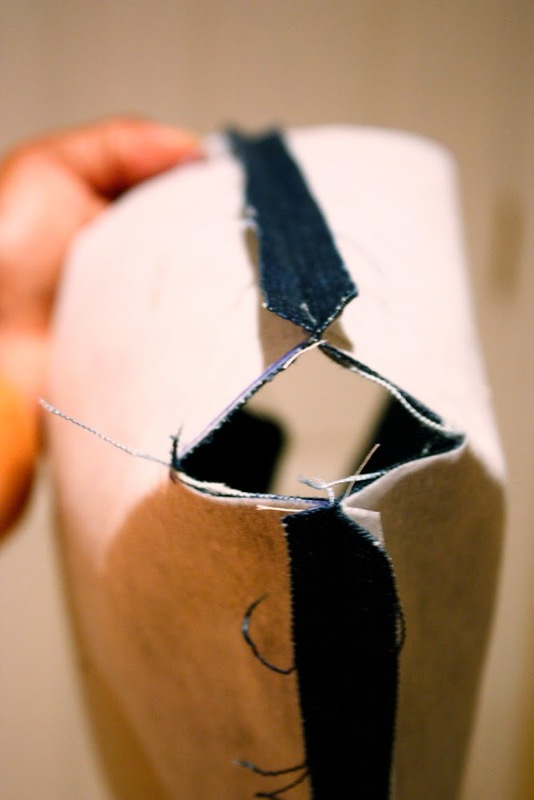 Now match the side seam to the bottom seam on each corner. Trim and sew across with a 1/4 inch seam allowance. Do the same for the bag lining. When you turn the outer part of the bag right-side-out, you should have something that looks like this. Now, let's work on the flap. 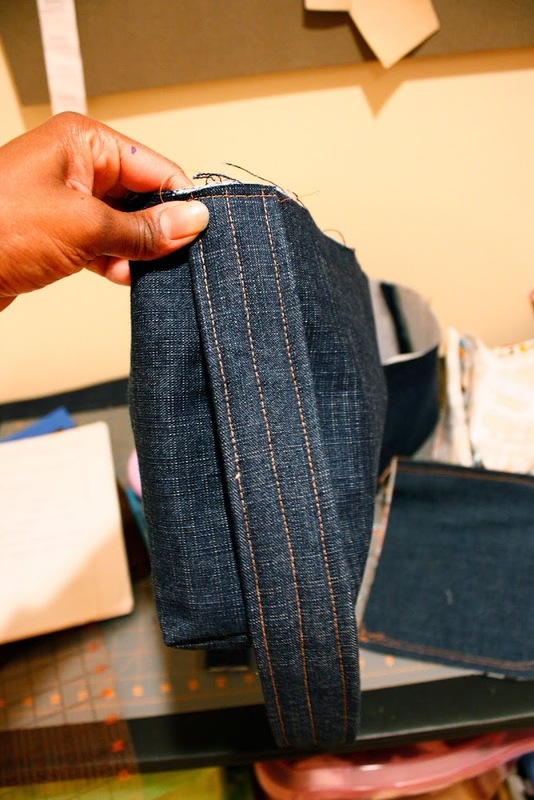 Fuse the interfacing to the wrong side of the fabric that you want to the outside of the flap. Next, we'll round the corners. Lay the 2 flap pieces out with right sides together. Fold in half matching the shorter (8 inch) sides. 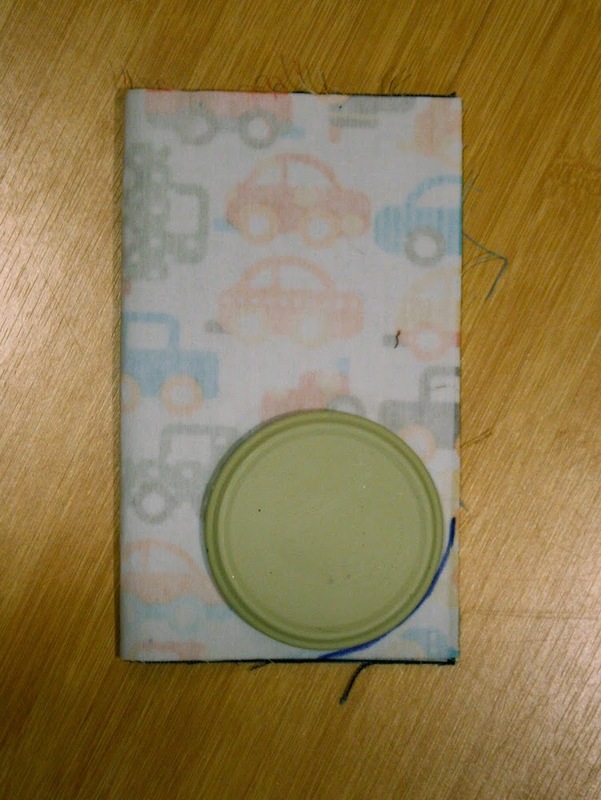 Use something round like a CD or jar cover to trace a rounded corner and cut. Here's what you'll end up with. Now along the long rounded edge, leaving the top, straight edge, open. 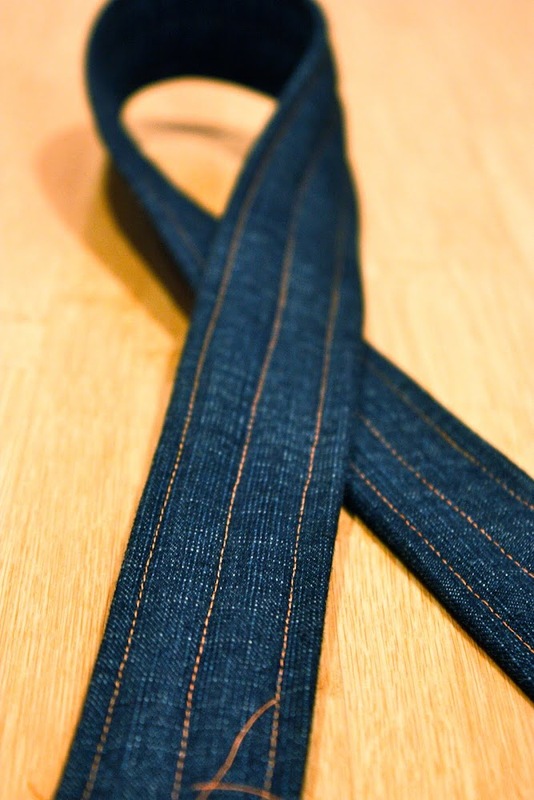 Clip curves, turn and top-stitch. Next, we'll do the strap. Take your strap fabric and fold it in half the long way. Open it up and fold the edges in to fold line you just made, essentially folding your fabric in quarters. Place the batting inside. Top-stitch along each long side and down the middle. Now we just need to put it all together. Pin the strap to the right side of the bag and then baste in place. Pin the flap to the right side of the bag and baste in place. Double check to make sure that the fabric you want to see will show when the flap is closed. This is the hardest part of the whole project. With right sides together, pin the bag lining over the bag exterior. You'll really have to pull it up to match the raw edges since you've got the strap and bag flap in there. One it's all nice and pinned, sew around the top, leaving an opening for turning. Turn and top-stitch making sure to close up the opening you left for turning. There it is! Fill it up with some fun little presents and give it to someone special. This is adorable! I love the fabrics you used! Love it. Great size for little ones. Thanks for sharing! So great, can't wait to make some! Thanks for sharing! This would also be a cute lunch bag for an adult! Would just need to use oil cloth on the inside. Thanks for sharing. Thanks so much for sharing. I recently made a similar bag for my nephew and want to make him another. This looks like I had been looking for to begin with. Thanks so much.It`s really cute!! OH.MY.HECK! What a great project! Thanks for a wonderful tutorial and pictures. Can't wait to make this! I gotta make one of these for my toddler! Nola is only 16 monthes but she already likes to carry my makeup around the house. This is a great idea. I linked your tutorial in my blog, I hope you don't mind. I love this! I finally made one with some blue corduroy and some owl fabric from Spoonflower. This is a fabulous tutorial!!! I made a bag for my son. Thank you for posting! Cute tutorial, looks great. I finally understand now how people use that method for boxing corners. Thanks! I just finished my bag for my daughter. She turns 2 in 2 days, and it'll make the perfect present! Thanks so much for sharing the tutorial!!! Thanks for the tutorial! 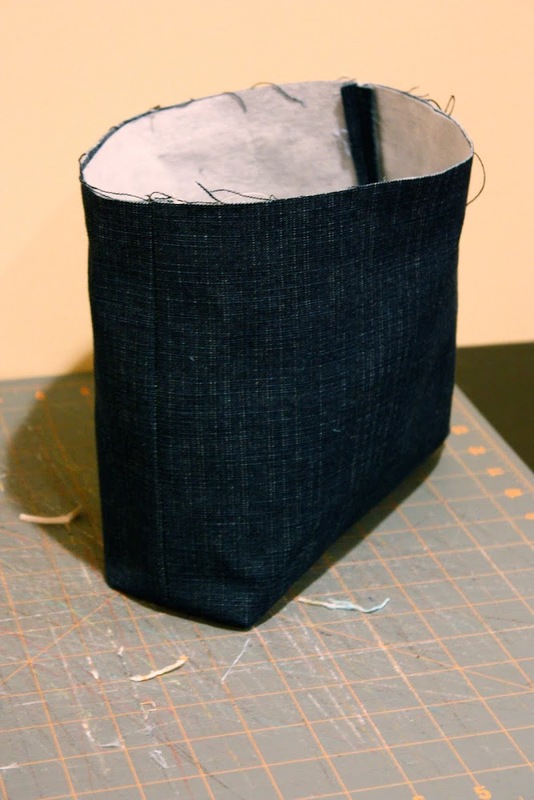 I started making a bag out of old jeans then found your tute so I incorporated it into my sewing :)Check out what I did! Thank you! I had a vision of a bag I wanted to make my newly-three-year-old, and this tutorial helped me make it happen! Very cute :) I must try to make one for my kid. Thank's a lot for great tutorial! Made one today, for a birthdayay party. Awesome tutorial! Lovely bag, perfect tute! Just made one tonight for a young friend's third birthday. Great tutorial! I made this for me as a mini cross body bag. Added several pockets and lengthened the strap. Turned out awesome!! Thanks for sharing! I so love this. I'm making one as a mini-diaper bag for my daughter. She keeps the large diaper bag in the car, but needs something for shopping to fit just a couple of diapers and some wipes in. wow, i love this bag! your directions are really great - thanks for the wonderful tutorial! what are the dimensions of the completed bag?? thanks! Thanks for the great tutorial! I made my 3-y-o one with Spiderman fabric and denim. Your instructions were very clear. Thanks! Your tutorials are so great! You definitely have the mind of a teacher with the perfect photos to add to your explanations. Super cute! I know this from 2011 but I hope you will link this up to The cSI Project. The challenge is back to school. Each week is a new challenge. Come on over! What a good idea!!! Thank you for the tutorial!!! Thanks , I made it with a few modernisation , and a littlest one - reather two :) But it was your idea . Thanks again . 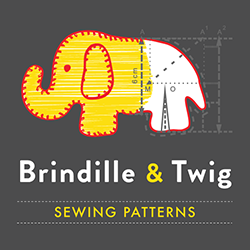 Absolutely wonderful tutorial and easy to follow instructions. I've made one with cute cupcake fabric and denim and I just love it. I think I'll be making some more and may even make one a little larger! Thanks so much for the tutorial and clear instructions! I made two of these recently (one for my son and another for our cousin, they both turned 2 this month). The tutorial made the process extremely easy! Thank you for sharing! Thank you for such a cute and adorable bag, I will be making these for charity and filling them with things like colouring books and pencils or crayons in a roll. So going to use this pattern for Christmas prezzies this year.... Thank you so much for sharing... Cheers. What a darling tutorial! Thank you for sharing! Fantastic - love it just perfect for my little girls tablet Christmas present and assorted accessories. Thank you - looks so easy to do. off to do one now! Great idea! This blog is a really precious souce to find something cute for Xmas gifts! Thank you and greetings from Italy! Seriously way too cute! I can't wait to make one of these for my son! I have scoured Pinterest for a cute and beginner friendly bag to make for Christmas for my girls and your tutorial was the winner. They are both getting diaper bags for their baby dolls and this was the perfect pattern. I am so happy to put a little handmade touch in their Christmas....thank you for sharing! Hello there. Love the bag and would like to make one for my books as I'm a college momma. How would you make the finished product wider, is it by making the corner cuts larger thank 1.5"? Thanks again for the tutorial. Hi Carolotta. I would try to make the main bag piece wider (maybe 18 inches) and still cut the corners the same, to make the bag wider. If you want the bag to be deeper, you could increase the corner cuts, but keep in mind it will make the bag shorter as well. Good luck! 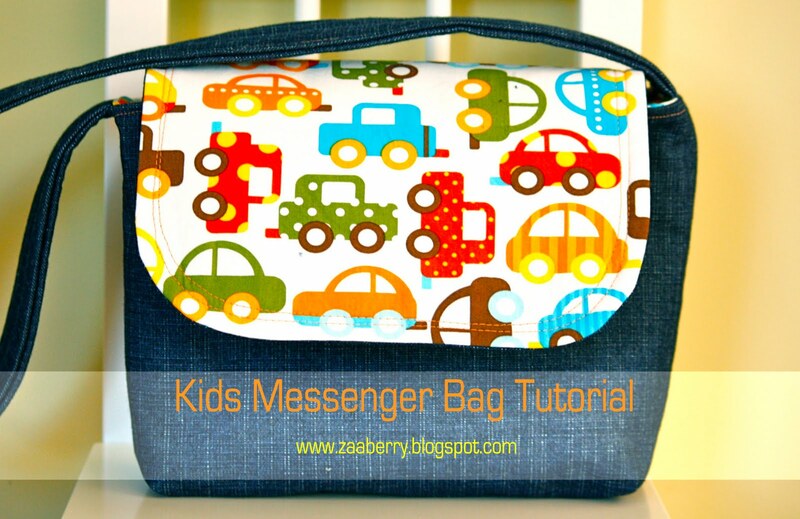 this is THE best little messenger bag around the blogworld for kids...the tute is great and the finished product is awesome!! Thank you so much for the tutorial. I have just made my first ever messenger bag following your tutorial. I certainly will make for some more in the future. Any one on here in the uk that could make one for me? Happy to pay material, time, postage? Its for an 18mth old so doesnt need to be big, or expensive material but I would like it to look like "Mr Tumbles Spotty Bag"? 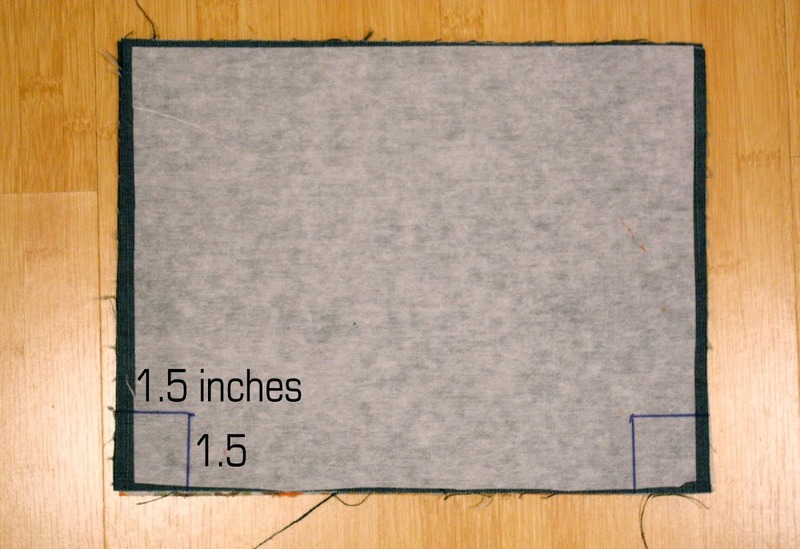 I'm relatively new to sewing, and I have a question about this step: "One it's all nice and pinned, sew around the top, leaving an opening for turning." May I know how many inches i should leave to be able to turn the bag out easily?? thanks for such a wonderful tutorial... :) can't wait to make this for my 3-yr old daughter to take her dance clothes to class! Hi Joyce. I would leave an opening of about 3 inches. For me, that's big enough for me to get my hand inside. Hope that helps! Happy sewing. Just wanted to thanks for the brilliant messenger bag tutorial, it was easy to follow and once I'd converted the measurements for the UK I was away! Have just finished making it for my 3 year old daughter,it's a perfect size for all her little things. Thanks again. I love it!!! I'm going to make one for my niece. She will love it!!! I made one of these today and wanted to say how grateful I am to you for doing that hard part of figuring it all out. I made it for my 10-year-old daughter as a purse, so I added several interior pockets as well as a slip pocket across the width of the back. 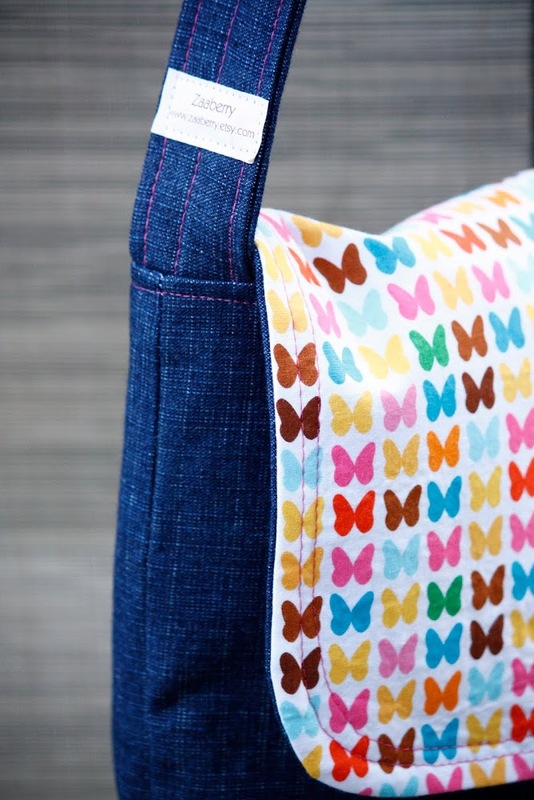 I used patchwork for the flap and drop cloth fabric for the body with contrasting cotton binding. I didn't change anything about the measurements, though, and the finished bag is 6x8x3. Perfect and she loves it. It took just a couple hours including planning out the pockets and fabrics. Thanks, again. It was fun. Hello - I came across your blog after finding an image of one of your bags on Pinterest while I was searching for some fresh ideas for my handbag website (no don't worry, not to copy :) )- I am glad I found your blog, you do great work - do you sell any of your finished work? OK... I'm addicted. I've made FOUR of these bags just today! I think my husband is taking internet out of my craft room! I had the tutorial open and kept rolling back and forth across the floor to read along. Thanks for excellent instructions! One question - what's the piece of interfacing for the bottom? When/where does that go? Looking at it now, I see why it's confusing! The interfacing gets fused to the main bag panels, which I guess at the time I called the bag bottom. Let me know if that doesn't make sense. Thanks for the comment! Thank you for the tutorial. I have spent the afternoon making a bag for my boy who is turning 6 his week. I changed the size to 12 x 14.5 with a 30inch strap. I really appreciate the tutorial as I am a novice to sewing and would not have been able to make it on my own!!! I was wanting to find or make a lunchbox for my daughter, I think I'm. going to try to line it with a old sun visor, Ill have to let you know how it turns out!! i have just made this bag for my little boy for christmas. having searched many shops and online i couldnt find a bag that i liked for his kiddie tablet my mum has got him for christmas. I love the bag its the perfect size for his kidzstar and he'll love the rocket fabric i have used. i also added a little drawstring bag to pop the charger into this will stop it from falling out everytime her gets his tablet in and out. im sooo pleased with my little project!! Can I ask if the strap ends up been 4" wide or 2"? Thank you. thanks for the great tutorial - such a quick project and the perfect size for my 2 year old! Wow what a great tutorial. I really love the bag and the prints. I am so creative and love to do creative things more than my job. I love this tutorial and going to try it out this weekend. Thanks for sharing this. Thank you for the tutorial. These are so cute. I instructions were mostly easy to follow. I wasn't exactly sure how the strap was supposed to be, but finally figured out they are supposed to be 2" wide. I made one for my grandson to carry his tablet and headphones in. I increased the height about 1" and the width about 1.5" so it would be big enough, making adjustments for the flap. I embroidered his name on the front flap. I put it in the center of the flap. I should have measured down 2" from the top and then centered embroidery in that. In addition to the medium stabilizer on the flap, I also used a layer of iron-on no-show mesh stabilizer, which gives the flap a little more firmness and more stability for the embroidery. Next. I made 2 more for, one for each of my grand daughters. I put the embroidery in the right place. I made the straps about 1/2" narrower (7" instead of 8") and only used 1 thickness of padding. Double padding was just to cumbersome to stitch neatly. I also shortened the straps on all 3 bags to about 18". On these, I got the embroidery a better place, though could still have come down about an inch. If I make more of these, I will make the strap a little more narrow. It's too wide for my hands, so surely to wide for a child's little hand. I think next time I'll shoot for around 1.5" wide. For me, the hardest, and most time consuming part was pressing the fabric, pressing on the interfacing and cutting them out. Once all pressed, fused, and cut out, they took around 30 minutes to assemble. As suggested in earlier posts, I put the lining on the inside and the bag on the outside to stitch together. I think I'll try my heat press for fusing the interfacing on future bags. I used your pattern (thank you) and did a blog post today featuring this bag and did a shout out to your blog - I posted the link to the pattern at the end of my post. Thank you so much. Love the bag. I just made this bag and it turned out awesome! Thank you so much for the tutorial! Great tutorial, many thanks for giving me not only the inspiration, but also the courage to start a project like this! Thanks so much. I'm expecting my second child and wanted a bag for my son to use as a diaper bag for his doll so he can be like Mom. This is just what I was looking for, a simpler smaller form of my bag. I'll be able to have time to make this. Do you have a picture of the inside of the bag after done? Thanks for sharing. Thank you for your pattern, I was very pleased with the result. 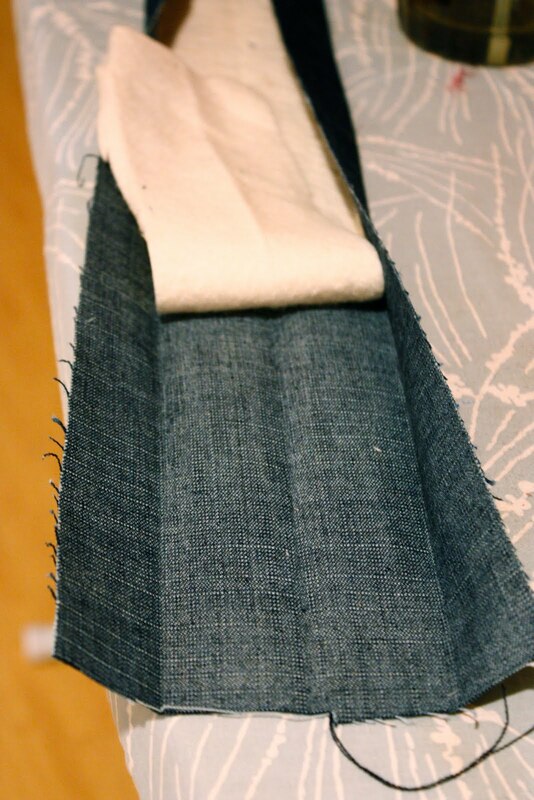 I did find it easier to turn the bag by leaving the base of the lining open a few inches, also easier to stitch up. thank you so much for the great tutorial and pattern! I made 3 so far and I have a feeling I might make some more in the future. My daughter uses hers as a schoolbag and she loves it! What a great tutorial and just what I was looking for. I found pics on Pinterest of Daisy vests and tunics turned into pillows and totes. My granddaughter requested a tote and I found this tutorial. I had to make adjustments to the piece sizes and seam allowances avoiding the patches. I still had to relocate six patches as none could be eliminated per granddaughter. I added binding to the flap and should have stuck with the pattern, the cutout squares had to be 1" because of patche placement and I made the handle 1.5" wide. The pattern was a perfect guideline. Thanks so much.